Recently, there has been lots of news about Freshwater Beach and the important centenary which was celebrated there on January 10th – the centenary of Duke Kahanamoku’s surfing demonstration. Yet there have been few photos which showed the beach at the time, and so The Past Present decided to share one from the collection. Long before Europeans settled Australia Freshwater Beach was known by Aborigines who no doubt used the freshwater creek which flowed onto the beach, and after which the beach is named. Less than three months after Europeans arrived in Sydney Governor Arthur Phillip led an expedition around Manly and towards Freshwater but he is, perhaps, not the most famous man to grace the shores of the beach. This honour may well go to Duke Kahanamoku who popularized surfing in Australia. Surfing at Freshwater actually dates to before his visit with the Boomerang Camp, which was established at the beach in the early 1900s, being frequented by many locals and visitors who used the beach for Body Surfing. It was the people of this camp who established the Surf Life Saving Club at the beach in 1908 and it was also this camp where Duke Kahanamoku stayed. ‘The Duke’ was a Hawaiian of international renown and he arrived at Freshwater in the Summer of 1915. During his stay at the Boomerang Camp and Freshwater Beach he created a solid surfboard, crafted from local timbers and it was this which he used in his famous exhibition of surfboard riding. He paddled out on the board and returned to the beach standing tall and riding the wave. What’s more, he then selected a local lady from the crowd, Isabel Letham, who rode tandem with him on his board. She was the first Australian to ride on this type of surfboard in the Australian surf, but it was The Duke who popularised the sport. 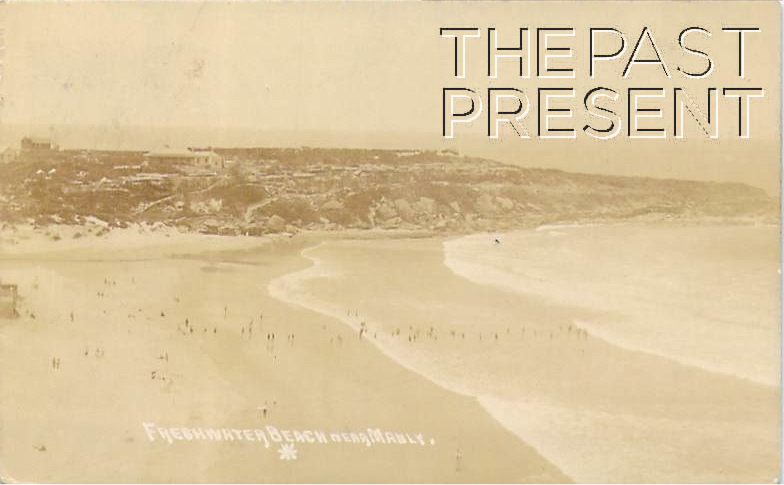 This entry was posted in New South Wales, Sydney Suburbs and tagged 1910s, 1920s, beaches, entertainment, famous people, leisure, postcard collection, sydney, tourism.